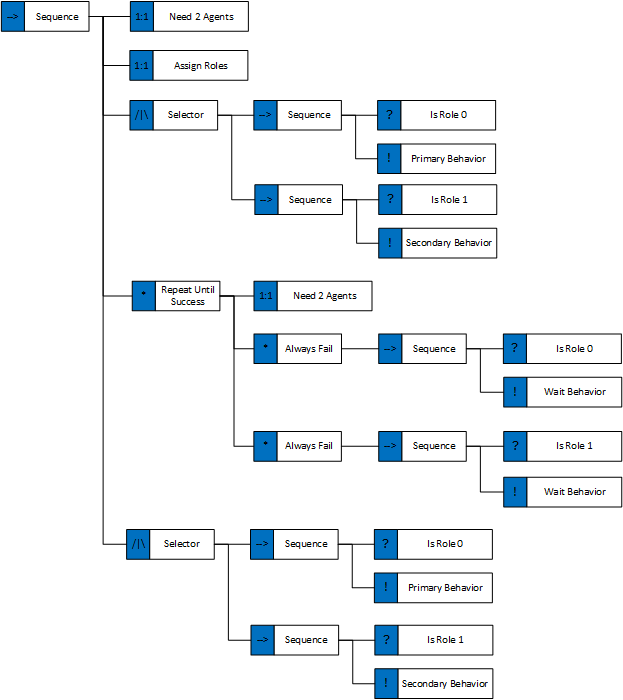 Firstly, regarding the sharing of behaviour trees between agents: doesn’t everyone do that? You want the definition of the nodes to be immutable and the code for evaluating the conditions to be stateless. Then when there is work to be done over time, context objects are created (or allocated from a pool) and returned. Since only a few nodes (the sequences and the active behaviour) need to store any state across frames, this becomes very efficient. 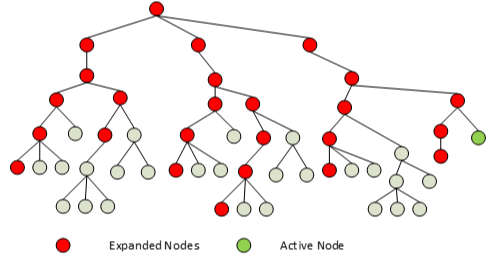 It also means that sharing sub-trees between different main trees is trivial and obvious. Secondly, on global state: I don’t see anything particularly wrong with your global variables, but I don’t think there as useful as they seem at first. On a game I worked on before we had a Try/Lock node that would attempt to acquire a named resource and if it did it would execute the subtree under it, releasing the resource when that completed (or was terminated). The resource was defined within a central AI Coordinator and you inevitably end up needing something like that. The resources might not just be counters – they can be more dynamic than that. In the example of limiting the number of enemies that should attack, you would also need to decide which are the best ones to attack the player and that’s not a decision that easily made by individuals – if the criteria included some spatial test on which enemies had the ‘best’ shot, how would they know where they stood in such a ranking?. So you want to make decision like that in one place and then either set a variable in the selected AI’s knowledge, or allow them to acquire the permission when they next evaluate the relevant Try/Lock type node. On your Monitor node: I’m not sure about this – it’s making the designer get involved the mechanics of evaluating the BT rather than being allowed to focus just on the logic of the conditions. What you’re trying to work out is whether a running behaviour should be pre-empted if a higher priority one is able to become active. 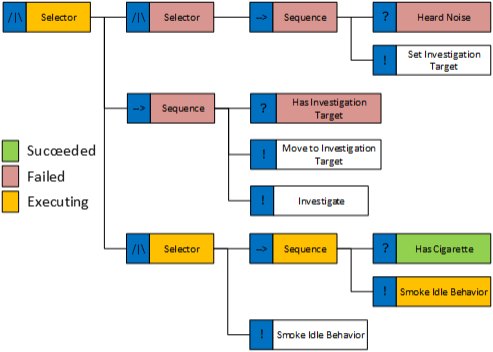 You could solve this by working out which running behaviours could be pre-empted by any particular variable changing (by examining the upstream conditions), then in the code that accepts variable changes from elsewhere in the engine, check do see if any of the pre-emptable behaviours are active. There’s some tricks you could do with bitfields to make this extremely cheap. Of course you’d have to watch out for variables that change all the time like ‘distance to player’, but I don’t like the idea of writing conditions that depend on low-level information like that anyway – decisions should more be based on variables that are set by your sensor system (hopefully you have a sensor system to lazily evaluate world state and set knowledge items as a result), so won’t be changing every frame. 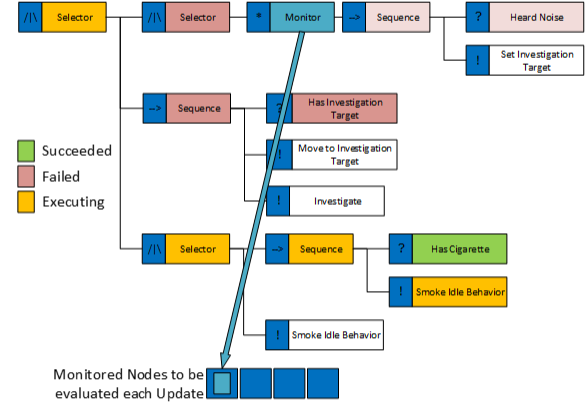 In your example of not wanting to re-evaluate the tree because it causes the AI to drop out of the investigate behaviour, the way to solve that is with more appropriate state. When a sound is heard a knowledge item with the location is created. That knowledge item can also contain a status that says if it is new, if it is being investigated, if it has been checked. The condition for getting into the sequence would check to see that the status was set to new. The first action in the sequence after arriving at the point of the sound would set the status to ‘being investigated’. At the end of the sequence you either delete the knowledge item or set the status to ‘checked’, If the investigation is interrupted, you will want to change the status in some way. You can have a decorator node that changes knowledge items on sub-tree exit to solve that. Lastly, on a philosophical note, I don’t believe in visual programming, in that I don’t believe making a programming language into a visual graph makes it any easier for non-programmers to understand. For example, on a previous project we had one designer who made all the logic for the behaviour trees (and the animation state machines), but none of the other designers could. Turned out this one designer was making games in UDK in his spare time and could have written the logic in UnrealScript if we’d let the designers near that. 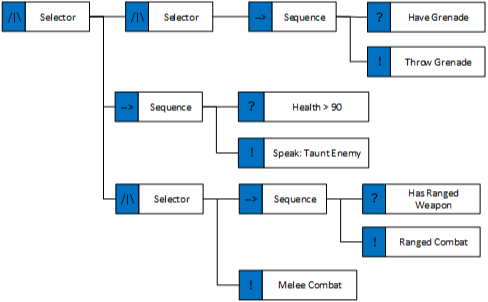 The very high level behaviour tree systems don’t include the ability to set variables (or knowledge items/facts, whatever you want to call them). They are not programming languages in any meaningful sense, just decision trees. As soon as you introduce the ability to change variables, you have a de facto programming language. If you do this, make it easy to manage. I’ve seen trees that were full of useless sequences just because the designer wanted to set or clear some variable before or after doing something else. A good range of decorator nodes can get around this. 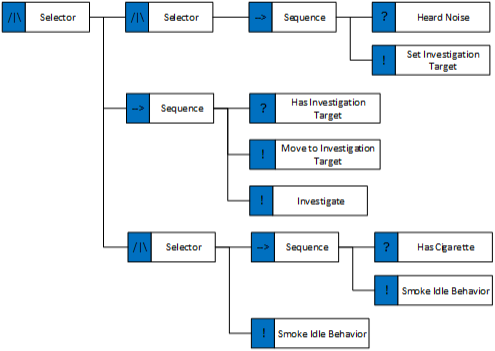 Also, if you are going to put a log of sequential logic into a behaviour tree, make sure you budget time for debugging tools that are easy to use. Debugging AI is 90% answering the question “why the hell did that happen?” so you want to be able to log why decisions were made to a text log at the very least and ideally that would be part of a replay system. Wow Richard, thanks for the in-depth comment. I will try my best to reply to it paragraph for paragraph. You’d be surprised, I’ve seen some cases where each agent had it’s own instance of the tree. It’s not that different from a naïve separation of the state from the tree. As for your second point, I don’t entirely agree. In my case, the condition nodes tended to be the heaviest nodes in the entire tree and so that’s why my approach prevents them from being executed except when absolutely necessary. 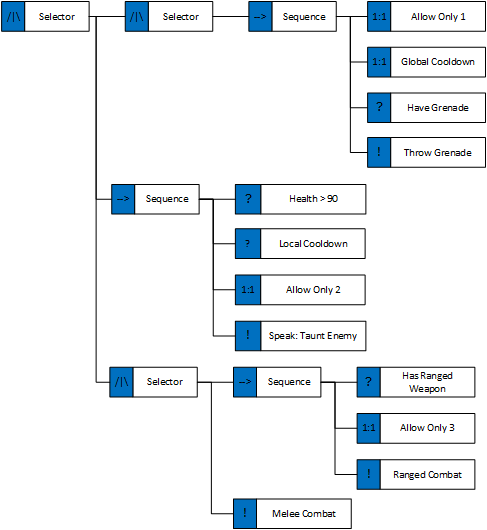 So if I’ve run a condition that checks whether I’m in combat, I don’t need to rerun it every subsequent update unless something has changed, at which point it makes sense to re-run the entire tree. I’m having a hard time explaining it better without some more concrete example, perhaps its worthwhile making a few and adding them to the post. I actually made a design decision that the BT in my case would not be allowed to access any systems outside of the agent’s knowledge. Each frame we would reflect relevant world updates to the agents through a sensor architecture and the BT would operate entirely on that information. I don’t believe in having multiple AI coordination systems and wanted only the BT to be responsible for any decision making. As such I wanted the tree to be the owner of all “resources”. Now, we also had the concept of tree-spawned transient sensors which the agents would have attached and would be updated as part of the AI updates. These sensors could be shared amongst a few agents allowing us to do combat coordination and so on. The global objects also made it easy for us to share these sensors through the tree by asking the tree for the shared sensor for a given situation. I guess you can think of the tree as the AI coordinator. I think I have unintentionally confused people with saying it gives designers more control over execution. Designers don’t need to be aware of what the node does, all they need to know is, if I want some state change to be monitored, I can use this node to do exactly that. Trying to pre-empt behaviors is something that we couldn’t do since we would never have a complete list. We would inject new behaviors at runtime and composite new agent archetypes from existing behaviors. This is where the biggest problem in my opinion with BTs comes in, the implicit transitions between behaviors as well as the require dependencies between behaviors. I have yet to find an elegant solution for having two states in the BT which have equal priority. Trying to manage the transitions to/from and between those states is a complete nightmare. Especially when you are trying to keep them separate since not all the archetypes have both states in their behaviors. I also don’t particularly like bit fields due to their poor performance. AFAIK compilers still cant effectively optimize access to them. As for the re-evaluation for investigation it was a contrived example. Working on Hitman, investigation disturbances was our bread and butter. We just had multiple investigation states and had to transition between them based on rules. The trivial investigation case isn’t the problem. It’s also worth mentioning that we were doing ALL group coordination in the same tree via an agent centric approach. There were no other systems involved. All group decision making was done in the same behavior, and to be honest, the results were better than I had hoped. At some point I guess I should try to discuss that as well. On your philosophical note, I have to disagree. 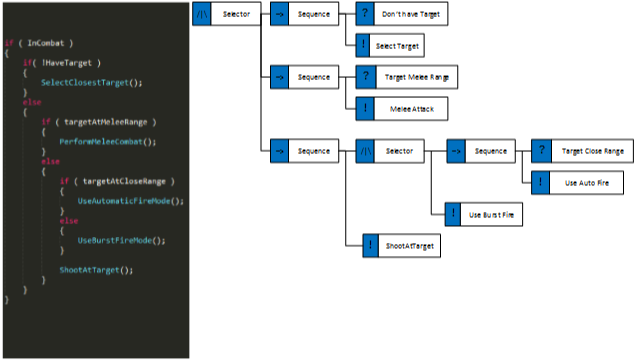 I find visual programming to be the best tool we have right now given a lot of the newer devs coming into the industry. A lot of my experience is outside of the games industry and I once had to work with a language called labview. I initially thought it was a toy language and scoffed at it but after a while I was a convert. I mean even Epic has phased out unrealscript to be replaced with c++ and kismet. I think visual languages can be extremely powerful given a good debugging environment (this is crucial). We didnt want to use text logs but wanted to record game state and could actually pause the game, rewind and follow the tree traversal and see exactly how the knowledge changed node by node. Our animation debugger worked exactly like this and was infinitely better than a text log could have ever been. And like you said you had one designer that could do that but the rest couldn’t. I don’t like the idea that those designers should then be locked out of the prototyping/building process. Ideally I think all designers should know how to program on an elementary level but that will never happen. So given the current environment I want to try to include them as much as possible. Its extremely frustrating for both parties when a programmer has to be a transcriber for a designer’s ideas. 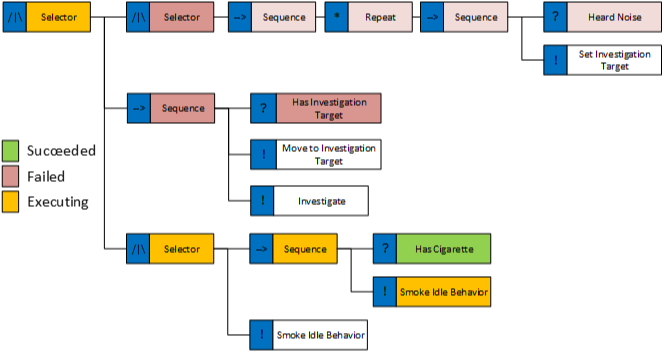 One final point, I actually think behavior trees are and should be analogous to a programming language. I want them to be a way to script behavior, not just define behavior transitions. If the transitions were all I wanted, I would have stuck to HFSMs which in my opinion solve that particular problem in a much better way. I really have a idealogical problem with the implicit state transitions present in BTs but that is another topic. – I don’t like the idea of messing with the “the BT always evaluates from the root” semantic. It’s something that, in y experience, everybody understands well. – I don’t understand (like at all) your issue regarding the selector, and the “smoking” interruption. It’s only broken because your selector is designed like that, in MASA LIFE (as well as in a lot of BT implementation I’ve seen) we have a concept of an “active” selector that reevalute all its children at each step that can be used when this kind of interruptibility is needed. – Regarding you synchronization/gate system I like it very much! In your use case though I’d have used a upper level “choreographer” decision making system, implemented with a BT for example, to assign roles and/or behaviors to the different NPCs. Anyway if you want to visit Paris and work on this kind of issues we’re recruiting 🙂 ! This is the first time I see someone spelling out some problems I have with the Event-Driven BT. (losing reactivity and no explanation of Parallels) I would have like to read how you handle your Blackboard especially as you said you are reusing the BT for many Agents and in a newer post stated that you see issues how data/communication between systems is streamlined in AI. Maybe it slipped me though as I am sure I have to re-read it. Great article! It’s nice to see someone go deeper than surface level. As I read about goal-based architectures (and evaluators), BTs, and FSMs, it’s sometimes not clear why I’d use one approach vs. another. Any quick advice before your next write-up? You have made this article very useful. I was pondering lately on how to manage the updates in BTs and reached two possible solutions that you named Event Driven BT and the opposite and never new witch one is better / downsizes. I want to implement a BT for a small rts with single central coordinated BT, so loosing reactivity of the tree is something that will certainly not work.